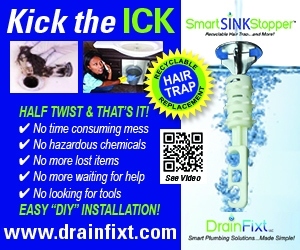 Solving common household drain problems. Everybody knows that plumbing can be a messy, smelly and altogether nasty job. Nobody wants to do it except plumbers, who make good money doing the work nobody else wants to undertake. The best way to handle a plumbing problem is to avoid it completely, but once the pipes are clogged you can usually solve the problem by following the guidelines detailed here. 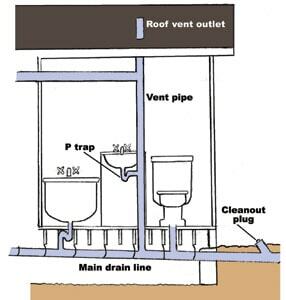 Let’s start with the basics of a drain system: Water is carried away from sinks and appliances and out of the home by gravity, which forces the water through pipes ranging in size from 1-1/4 to 4 inches in diameter. The size of the pipe depends on the size of the fixture. The larger the plumbing fixture, the larger the drainpipe. Kitchen and bath sinks typically drain into 1-1/4- or 1-1/2-inch waste pipe. Two-inch pipes are common for laundry drains, and 3-inch pipes are used for most residential toilets. However, don’t think that the bigger the pipe, the better the drainage. On the contrary, the extra space within the pipe actually dissipates the pressure built by the water’s gravitational flow. As a result, a smaller pipe maintains greater pressure and transports water more efficiently. Each fixture has a drain equipped with a trap, made from curved sections of drainpipe. Traps hold a small amount of water that seals the pipe to keep sewage gasses from backing up into the house. They’re also handy for catching wayward objects that disappear down sink drains, such as toothbrushes, hair clasps, etc., which can be rescued by using a wrench to unscrew the trap. Connections between differently sized pipes can be made by fitting a reducer between the two pipes. When installing new plumbing, keep the waste-pipe route as straight and short as possible as it extends from the trap to the primary drain stack. When plunging, use a wet rag to seal off the overflow drain to create a vacuum. When planning the waste pipe of a plumbing fixture, always ensure the proper slope. Clogs can easily occur in horizontal runs of pipe, so install a minimum slope of 1/4-inch per foot. Fixture drains also have vents that relieve pressure and allow water to flow out freely. These vents connect to the main vent stack that exits through the roof of the home. Even in properly installed plumbing, clogs can still develop, so install a “repair-friendly” system to ease your headaches when the time comes to address a problem. One trick is to avoid 90-degree bends in underground pipe. These sharp bends can slow the flow of water and are also tough to navigate with plumbing snakes. Similarly, use 2-inch traps for tubs and showers, which also accept drain-cleaning snakes more easily than 1-1/2-inch pipe. Picture this dire situation: The drain is completely clogged, your kid left the faucet running and water is cascading down the stairs from one floor to the next. What to do now? Well, for starters, try not to let things get quite that far. Keep a sharp eye out for signs of a sluggish drain. It’s easier to unclog a slow drain than it is to open one that has completely stopped. 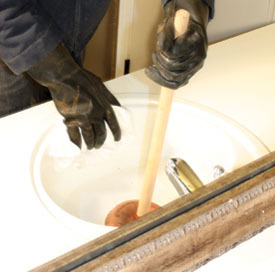 When the drain is slow, pour scalding water down the pipe to loosen any buildup of grease. Also, clean the stopper or drain screen. If this doesn’t locate the problem, then check the other household drains to determine if the clog is only in one fixture. If more than one drain is clogged, then there is a clog in the main drain pipe. 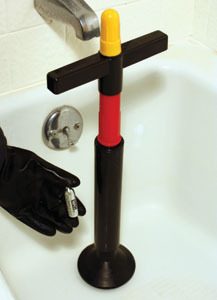 The first tool most people grab to fight a sink clog is a simple bathroom plunger, which is designed to force water through a pipe to push out a clog. Pick a plunger with a large enough suction cup to completely cover the drain and create an airtight seal against the surrounding sink. Fill the fixture with water to completely cover the suction cup (it may help to coat the rim of the cup with petroleum jelly). 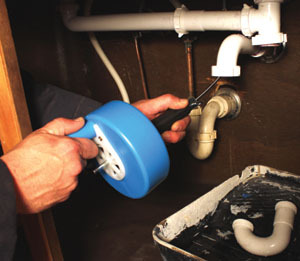 Seal off any other outlets, such as the overflow drain in sinks, to create a vacuum. Push out any trapped air beneath the cup, then give the plunger 15 to 20 vigorous up-and-down pumping strokes to jolt loose the clog. This may take 3 to 5 times to do the job. Plungers come in a variety of shapes and sizes. The classic cup-style plunger is best suited for sink and shower drains. Another style has a flange on the opening which can seal more securely into the bowl of a toilet, but that flange can interfere with use in a sink. Some of the more innovative plungers allow the user to draw water into a cylinder and then push it out with sudden force to remove the clog. If a plunger doesn’t work and you have access to the P-trap beneath the drain, then use a wrench to remove and inspect the trap. Many times the trap is congested, and a thorough cleanout and replacement is all that’s needed. To use a snake, remove the trap to avoid tight bends in the pipe. To clear stubborn clogs or an obstruction further down the drainpipe, a plumbing snake is a handy tool. A plumbing snake is basically a flexible steel cable that works its way through the drain pipe and physically pushes through clogs, making it one of the most reliable tools for solving the problem. However, the snake doesn’t work well in tight turns, so remove the P-trap and the horizontal trap arm from the rear wall. Insert the snake directly into drain pipe. When snaking a tub drain, remove the overflow plate and snake the cable down the overflow tube. Push the snake into the pipe until you hit the obstruction. Try to hook the clog by twisting the snake’s handle. When the clog is hooked, push the snake back and forth until the obstruction breaks up. Then flush the pipe with cold water. A closet auger is similar to a plumbing snake but the end of the auger is bent to fit through the tight curves of a toilet trap. A closet auger operates using a hand crank to rotate a cable encased in a rigid shaft. If more than one fixture is clogged, then you may need to clean out the main drain line. To do this, locate the clean-out plugs on the large drain pipes in your basement or crawlspace. These drain lines may be found in a garage or outdoors, along the foundations of the house. Each plug has a cap with a square fitting at the top. Remove the cap with a wrench. Be ready with a bucket to catch dripping water. Also, make absolutely sure no one is going to be using the facilities while you have the main drain line open. Use a plumbing snake to break up any clogs in the open main line, running it in both directions of the pipe. Some devices use compressed air to blast through tough clogs. If you don’t have a plumbing snake handy, or you want to avoid removing the traps, you might try one of the new clog-removal products that utilize compressed air. Hardware and home stores now sell products that shoot compressed air into the drain that forces the clog to move. Some compressed-air products are sold in disposable cans, which often work quite well. However, if the air-burst doesn’t work and requires repeat treatments, the compressed air cans can get expensive. Another type of compressed-air product is a reusable device that uses cartridges of compressed CO2. Once the tool is loaded with a CO2 cartridge, just press down firmly on the handle and a needle punctures the cartridge, sending a powerful burst of air into the drain, instantly unclogging it. The advantage is that you can keep the tool for future clogs, and all you have to replace are the individual cartridges. 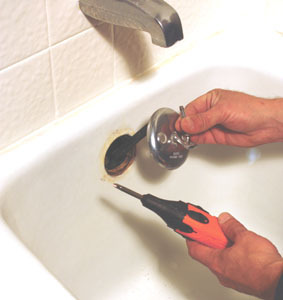 Access the drain of a tub by removing the overflow plate. Although frequent use of chemical cleaners can damage your plumbing, they can be helpful opening the occasional plugged pipe. If water is slowly draining but the pipe is not completely clogged, then a liquid cleaner may do the trick. But don’t be suckered by the thin liquid products on the market. On more than one occasion I’ve poured a watery cleaner down a sluggish drain only to hear the product rush straight past the clog and into the nether regions of my plumbing system, leaving the problem stuck in the drain, mocking me. Each time this happened, I could swear I heard somewhere in the distance the faint sound of the manufacturer laughing at me. Chemical cleaners use either an acid or a base to dissolve stubborn clogs and organic matter, so choose a thicker product rather than the cheapest, thin liquid plumbing agents. The thicker products stick to the inside of the pipe and give the chemicals better coverage and contact with the blockage. Some products foam-up and cling to the inside walls of the pipe. Allow the product to sit as directed, usually about 30 minutes, and follow with running water to test the drain. There are a few red flags when it comes to chemical cleaners. The first is that the active ingredient is often chlorine bleach. This is bad news for septic tanks, because bleach can kill the beneficial bacteria of a septic system. These products are best suited for systems connected to a city sewer. Furthermore, liquid clog removers aren’t intended for all household clogs. For example, clog removers are not designed to remove the waste that may be clogging your toilet. Also, laundry drain clogs are often due to accumulated clothing fibers. Liquid drainers don’t dissolve these fibers, so those problems will probably have to be removed physically, not chemically. The general rule of chemical cleaners: Read the instructions on the label and only use it as intended. Always use in a well-ventilated area and wear rubber gloves. Don’t use a plunger if a liquid cleaner is in the drain, or you risk splashing caustic chemicals on your skin. And don’t pour in a liquid cleaner if the drain is completely blocked. Otherwise you’ll be faced with a sink full of caustic water – another mess you’ll have to deal with. With a little luck, following these pointers might save you some plumbing worries, or at least clear them up when the water starts rising. But of course, you can always resort to the Yellow Pages. When you do have to pick a plumber, you’ll want to hire a qualified, full-time professional and not just a “handyman” that does the work on the side. This especially applies to bigger jobs, but even the smallest job can turn big and expensive if not handled correctly. Paying a little extra for quality work may save a lot of money in the long run. 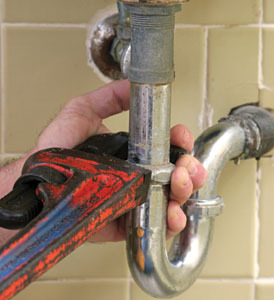 When choosing a plumber, request an estimate. Talk to your plumber about the overall cost of the job, even if it seems like its going to be a small, inexpensive project. Also, check for a license, ask for a time frame and professional references and confirm their insurance credentials. Plumbers come in all shapes and sizes and levels of experience, so do a little research before forking over any money.